In the last Home Archivist post, I tried my hand at processing letters from the MacKendrick family collection. At the end of that post, I expressed misgivings about some of the techniques and materials I had used. Since then, I have met with Doris St-Jacques, a paper conservator in the Maps and Manuscripts laboratory at Library and Archives Canada (LAC), and Greg Hill, Senior Conservator of Archival Materials and Photographs at the Canadian Conservation Institute (CCI). My visits with Greg and Doris were more than opportunities to learn about paper conservation from two experienced professionals. They were also opportunities to see inside two of the National Capital Region’s hidden archival gems. Doris works at LAC’s Preservation Centre in Gatineau, Quebec, a stunning amalgam of glass, steel, and concrete that houses preservation laboratories and 48 climate-controlled storage vaults containing some of the country’s most precious documentary heritage. This “modern temple of memory” employs approximately 70 preservation experts at work on books, manuscript collections, maps, films, photographs, and artwork that are part of LAC’s collections. When I visited the Preservation Centre, a team was busy processing the service files of the Canadian Expeditionary Force in anticipation of digitization. You can take a virtual tour of the building here. Public tours are offered occasionally. Contact 613.996.5115 for more information. The Canadian Conservation Institute is a more unassuming structure, tucked away in a strip mall in Ottawa’s east end. A branch of the Department of Canadian Heritage, CCI performs conservation work for public cultural institutions both large and small. 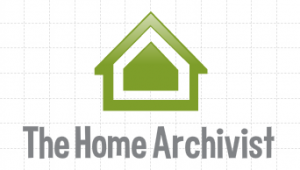 Past and present clients include the Montreal Museum of Art, Ruthven Park National Historic Site (Cayuga, ON), the Esplanade Arts and Heritage Centre (Medicine Hat, AB), and The Rooms Provincial Archives (St. John’s, NL). Conservation work at CCI tends towards large-scale single item treatments that require a significant amount of space and time. At present, Greg and his associates are restoring a large panoramic photograph of Niagara Falls from 1914 that languished for many years in the attic of Queen’s Park. The Institute also has a strong education mandate. Staff facilitate workshops across the country for museum, archival, and heritage professionals on topics such as preventative conservation, disaster preparedness, and housing and storage. 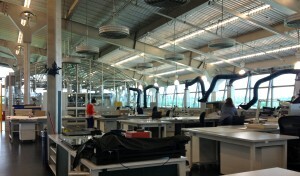 If you are interested in seeing inside the facility, CCI usually participates in Doors Open Ottawa. I thoroughly enjoyed meeting with Doris and Greg to talk about best practices for processing historical documents. Not only did both conservators give detailed answers to my questions, but they also took the time to demonstrate some of the techniques we discussed. In order to do justice to these conversations, what was to be one post on paper conservation is now two. In Part I, I describe some of the tools that enable conservators to preserve paper documents for future use. Part II will explore how conservators treat paper documents affected by dust, mold, soot, adhesives, and other accretions. A quick disclaimer, these posts are not intended as an instruction manual for the home conservator, but rather to increase public awareness of heritage conservation and to demonstrate the technical skill required to perform conservation treatments on paper. 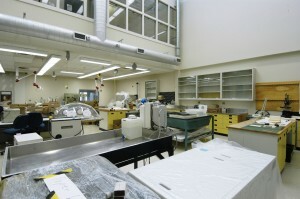 LAC and CCI have specialized facilities designed for the preservation of a wide range of archival materials. No home laboratory, however well equipped, can stand in for these kinds of facilities. Nor can a blog post replace the training and technical expertise of a professional conservator,especially when dealing with potentially hazardous substances like mold and animal accretions or performing delicate work like tear repair. To locate a conservator in Canada, please contact the Canadian Association of Professional Conservators (CAPC). Before meeting with Doris and Greg, I packed a shoebox with tissue paper and gently placed some of the letters inside. I felt like a child in kindergarten heading off for show and tell. I brought two bundles of letters with me—one in relatively good condition, the other with very visible damage—as well as two loose letters that were giving me trouble. 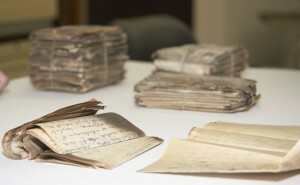 Both conservators thought the letters were in good shape, especially given the conditions under which they had been stored and the nature of nineteenth-century paper and writing materials. You may recall from previous posts that the MacKendrick letters lived in basements and attics for much of the last century. They also survived a fire. Most of the letters were written on paper made from wood pulp. Still a new process in the 1870s, wood pulp paper production relied on the use of strong chemicals such as bleach, as well as high temperatures and pressure. According to Cathleen A. Baker, this makes much of the wood pulp paper from this period quite vulnerable to deterioration. When considering treatment options, Greg advised checking the documents for watermarks, which tend to indicate paper of a higher quality that is less susceptible to deterioration. 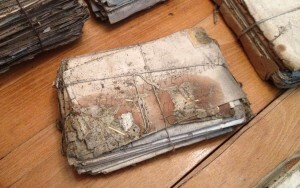 The longevity of paper documents is also affected by the surface materials. Most of the letters were written with iron gall ink, which when exposed to oxygen, especially in the presence of humidity, heat, and light, is converted to iron oxide, or rust. Over time, the sulfuric acid in the ink can also degrade the surrounding paper. The condition of the MacKendrick letters is evident in the state of the paper itself: tears and degradation, as well as discolouration. While the colouring on the rolled up letters visible in the foreground of the first photograph could be attributable to age, Doris thought it more likely a result of leeching or the transfer of colour from the cardboard box. What I had assumed was mold on the “bad stack” (photo on the right) was in fact not mold. The large stain along the bottom edge of the top envelope is an oil-based residue of some sort. The clumps at the other end of the same bundle are likely animal related, either the remnants of a mouse nest or perhaps, Greg offered with a chuckle, mouse puke. The former is worrisome because it could contain feces and urine, both of which are potentially harmful if inhaled. I wanted to know what both conservators would do if these letters appeared on their worktable. First, though, I was curious about the kinds of tools they had at their disposal. What follows is a list of safety and technical equipment Greg and Doris use for processing archival paper products. Particulate Respirator: Because of the ubiquity of dust and dirt and the possibility of mold and animal accretions, safety is paramount for the conservator. Staff at the Preservation Centre wear 3M N95 disposable respirators with a gated valve, which keeps the interior of the mask drier and cooler (model number 9211), but any N95 or N100 disposable respirator will do. Gloves: CCI uses purple nitrile gloves. A good fit is important. Gloves that are too big make it difficult to perform finer tasks. 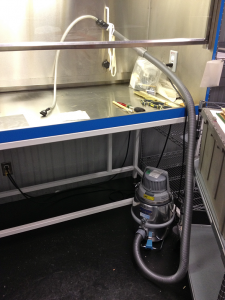 Vacuum with a HEPA Filter: CCI and LAC use industrial vacuums with HEPA filters for surface cleaning paper documents. HEPA filters remove 99.97% of particulate matter 0.3 microns in diameter, including mold spores. A more economical alternative to the Nilfisk and Miele vacuums used by LAC and CCI are Atrix HEPA vacuums. I’ve seen the Express and Omega models recommended. Alternatively, home vacuums can be adapted for conservation purposes with a micro attachment kit like this one. Variations on this kit are available through Canadian Tire and Home Depot. Paintbrushes: Doris and Greg use paintbrushes of different sizes and shapes for surface cleaning. Most are soft, for reasons I will discuss in the next post. 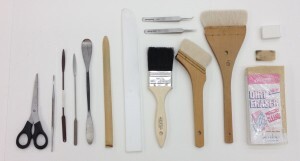 Japanese paintbrushes are ideal, although both conservators also had wall painting brushes in their collections. Brushes with light-coloured bristles are best because they indicate when the brush is dirty. I found most of my brushes at a local art supply store. I also ordered two through Carr Maclean. Sponges:Absorene Dry Cleaning Sponges, also available through Carr Maclean, are ideal for removing smoke, soot, and dust. These can be cut up into small squares to make the block last longer. Make-up sponges, available at most drug stores, can be substituted for Absorene sponges. There is a difference in the density of the two sponges, which affects their cleaning capabilities. Spatulas: As with brushes, there are a wide variety of shapes and sizes of spatulas. They are made from different materials (metal, bamboo, plastic, Teflon) and have different flexibilities. Metal microspatulas like these can be used to remove fasteners and tape, and to separate pages that are stuck together. Larger flat spatulas can be used to gently lift fragile documents. Greg makes his own spatulas out of sheets of Teflon (see the large white spatula in the photo above). Teflon is an ideal material for this work because of its non-stick qualities. Tweezers: Tweezers allow the conservator to work with small objects such as paper fragments and to perform fine tasks with greater accuracy. Here again, there is a range of styles. Screen: When working with fragile documents, Doris places a piece of plastic screen like that used in windows over the item to protect it while she uses the vacuum or brush to remove surface dirt. Mat Board: Large pieces of acid-free mat board (32” x 40”), typically used for framing, are employed to flatten paper documents. Mat board is available at art supply stores. In Part II of Dust, Mold, and Adhesives, we will explore how conservators use these tools to clean and flatten old letters. We will also discuss how they treat letters affected by soot or mold, letters that are stuck in their envelopes, and letters that are literally falling apart before their eyes. Note: A word of thanks to Leah Sander, an archivist at Library and Archives Canada, for organizing the meeting with Doris and for being my host on the day of. Jessica Dunkin is a SSHRC Postdoctoral Fellow in the School of Kinesiology and Health Studies at Queen’s University. Her doctoral dissertation, “Canoes and Canvas: The Social and Spatial Politics of Sport/Leisure in Late Nineteenth Century North America” (Carleton University, 2012), explored the annual encampments and regattas of the ACA from 1880 to 1910. In addition to working with the MacKendrick letters, Jessica is researching physical activity programming for urban working-class women in Canada in the decades around the turn of the twentieth century. You can follow her on Twitter at @dunkin_jess.